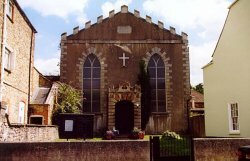 Roman Catholic Church - Faringdon Community Website. Among Henry's New Year gifts in 1532 was £20 in a white leather purse to the Abbot of Reading. Faringdon sat in Parliament from 1523 to 1539. In 1536 he signed the articles of faith passed by Convocation at the king's desire, which virtually acknowledge the royal supremacy. On Sunday, 4 November, 1537, he sang the requiem and dirge for Queen Jane Seymour, and was present at the burial on 12 Nov.
As late as March, 1538, he was in favour, being placed in the commission of the peace for Berkshire; but in 1539, as he declined to surrender the abbey, it became necessary to attaint him of high treason. As a mitred abbot he was entitled to be tried by Parliament, but no scruples troubled the chancellor, Thomas Cromwell. His death sentence was passed before his trial began. With him suffered John Eynon (or Onyon), a priest of St. Giles's, Reading, and John Rugg, a former fellow of the two St. Mary Winton colleges and the first holder of the Wykehamical prebend "Bursalis" at Chichester, who had obtained a dispensation from residence and was living at Reading in 1532.